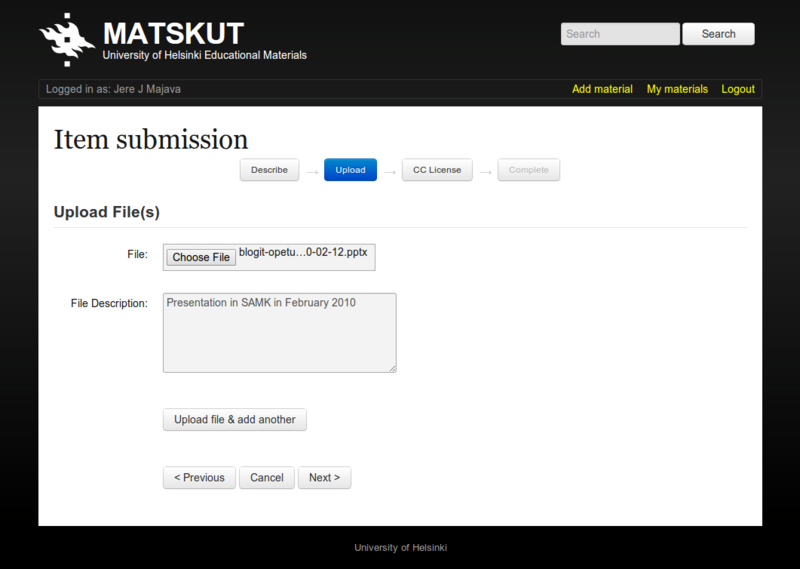 After logging in to Matskut you can add new material from the Add material link on the top bar. This opens the first page of Item submission wizard that has three stages. Let’s go through each of them in detail to get to know the basic functions of the service. You may click the screenshots of each stage to get a bigger picture of the interface. 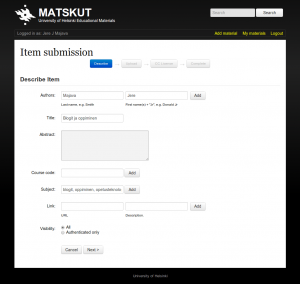 Content in Matskut in bundled into items. 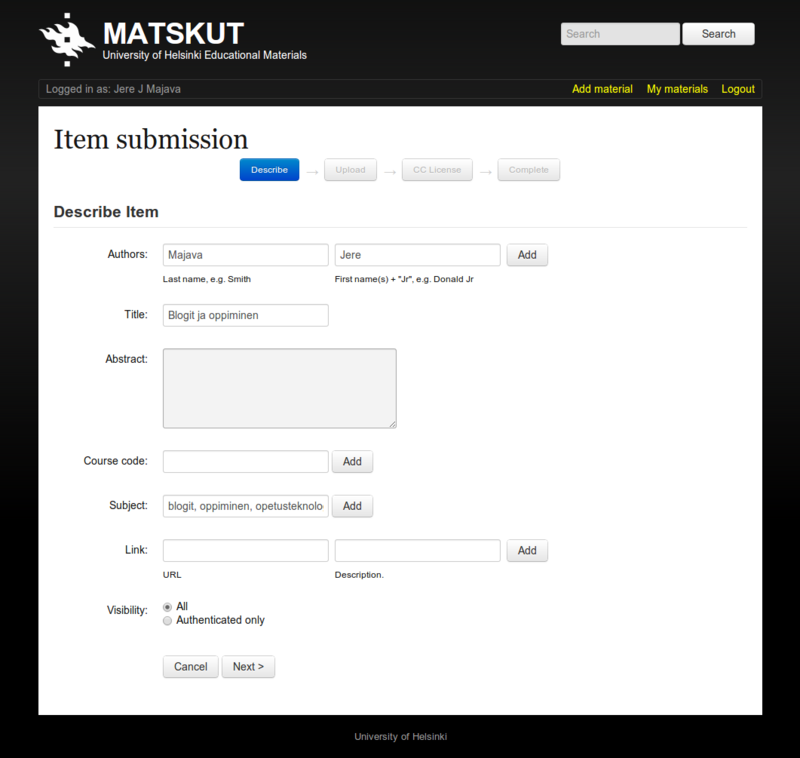 Each item has a title, author(s), some content (files and/or links) and some optional metdata. Author(s) – Each item needs to have at leats one author. Thera may be several. The author doesn’t need to be same as the person submitting the material, so usesrs may add material on someone else’s behalf, if so permitted by the author. Do note though that the submitter is the only person who can edit or remove the material. Title – Pretty self explanatory. Each item needs to have a title. 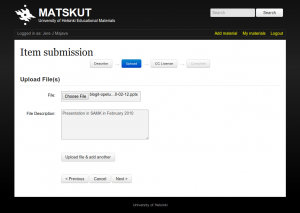 Link – In addition to files (see Upload files below) an item can include one or more links to external resources like articles on library repositories, YouTube videos etc. Visibility – The visibility may be set to public or only for logged in users. This restricts the access to the staff and students of the University. This is where the actual content is uploaded. There is no restriction on the size or type of files to be uploaded. Giving a description to files is optional. It’s usually good idea to describe the file especially if the item contains several files. Otherwise only the filename will be shown. 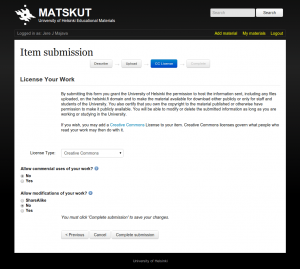 In addition to this you may licence your work with Creative Commons or make it completely Public Domain. This of course is completely optional.